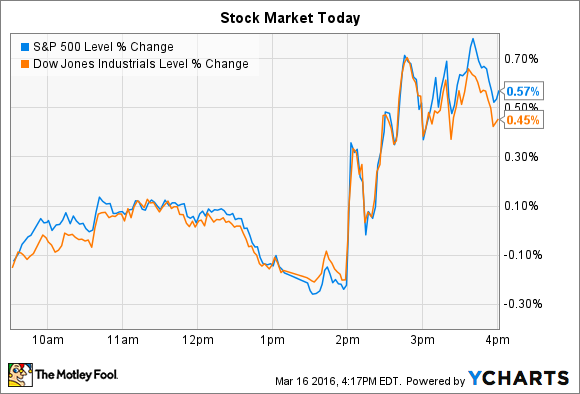 Major indexes enjoyed a Federal Reserve-fueled bounce this afternoon. Stocks meandered into negative territory this afternoon, but spiked higher after a key announcement by the Federal Reserve. By the closing bell the S&P 500 (SNPINDEX:^GSPC) gained 11 points, or 0.6%, while the Dow Jones Industrial Average (DJINDICES:^DJI) added 76 points, or 0.5%. Both indexes are now within 1 percentage point of positive territory on the year. In a new monetary policy statement, the Federal Reserve declined to raise interest rates today, while at the same time lowering its expectations for projected hikes this year down to two increases from the four it had forecast in December. Interest rates are now seen rising by half of a percentage point in 2016 rather than a full percentage point. Meanwhile, individual stocks making big moves included Oracle (NYSE:ORCL) and LinkedIn (NYSE:LNKD.DL). Software titan Oracle jumped 4% and extended its year-to-date gain to over 10% after announcing surprisingly high profit growth as part of its fiscal third-quarter earnings release. Earnings were $0.64 per share, or just ahead of the $0.62 per share analysts were expecting. Overall sales fell 3%, but rose by 1% after accounting for exchange rate swings . Drilling a step deeper into that increase, Oracle enjoyed a 44% spike in its cloud business, which now accounts for 8% of sales – up from 6% a year ago. And in a sign of continued momentum, the backlog of cloud revenue doubled in Q3. Management took the opportunity to contrast these gains with those of rivals including Salesforce.com (NYSE:CRM), which booked a 30% cloud boost last quarter . "We are growing much faster than Salesforce.com," Oracle chairman Larry Ellison said in a press release. "We also have many more [software as a service] products than Salesforce.com... Oracle has the ability to sustain its high growth over a long period of time. That should make it easy for us to pass Salesforce.com and become the largest [software as a service] and [platform as a service] cloud company in the world." In addition to the quarterly results, Oracle announced a new $10 billion stock buyback authorization that continued its hefty spending on its own shares. The company spent $8.5 billion on stock repurchases over the last nine months, compared to $6 billion in the prior year period. LinkedIn fell 5%, which brought its year-to-date loss to a brutal 51%. The professional networking giant hasn't had a big crowd of supporters on Wall Street lately, and it attracted a new bear today: Morgan Stanley analyst Brian Nowak downgraded the stock while lowering his price target from $190 to $125. Citing LinkedIn's slowing growth (revenue is projected to rise 21% this year after spiking 35% in 2015), Nowak said the service "isn't likely to be as big of a platform as we previously thought." The enterprise and talent solutions products might not find as wide of an audience, which makes the stock a riskier bet right now. The company is "at the crossroads of uncertainty," Nowak argued as he lowered his rating from buy to hold. "Upward revisions could cause relief in the stock, but we question whether that potential relief would hold given the execution uncertainty around the platform." While LinkedIn's growth appears to be slowing, it still operates a solid business with many potential avenues for expansion. Membership rose 19% last quarter to over 400 million users as engagement increased at roughly the same pace . The company's challenge will be to boost the value of the service to these users as they network with other professionals and seek to advance their careers. The challenge for investors is deciding how to value a business with such a wide range of long-term growth paths, without reading too much into daily price swings.